Experience, virtually, art that has shaped the world. Search by person, event, artwork title and more. “Discover” allows exploration of related topics. Save items to your own Gallery and share. Resources – useful writing lessons and other information. Multi-disciplinary middle/high curriculum on history of universe. 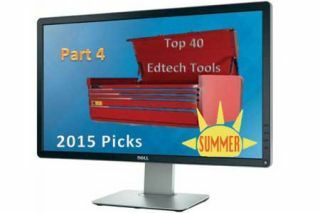 Videos, animations, articles, and classroom activities. Multi-player practice quizzes for students. Select “curated question set” or create your own. Give students the game code, then start. Teacher sees/can save student data. Great STEM game (Gr 8 -12) in 2-D fantasy world. Science/math skills used to help inhabitants. Individual/multiple players can be tracked. Daily news articles for kids K-12 selected by professional journalists. Reviewers (Gr. 4+ ) need adult sponsor on application. Students find books of interest. Adults gain insight into young adult reading interests. Develops writing, communications, problem-solving, and collaborative skills. Authentic, global (and guaranteed) audience for your class blog. One “Quad” blogs weekly – other 3 classes visit and comment.